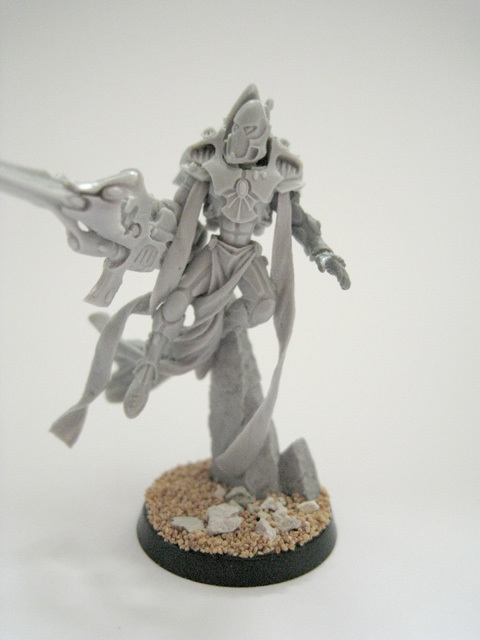 The standard Shadow Spectre Exarch miniature suffers from a few problems; most obviously the strange posing of his legs. 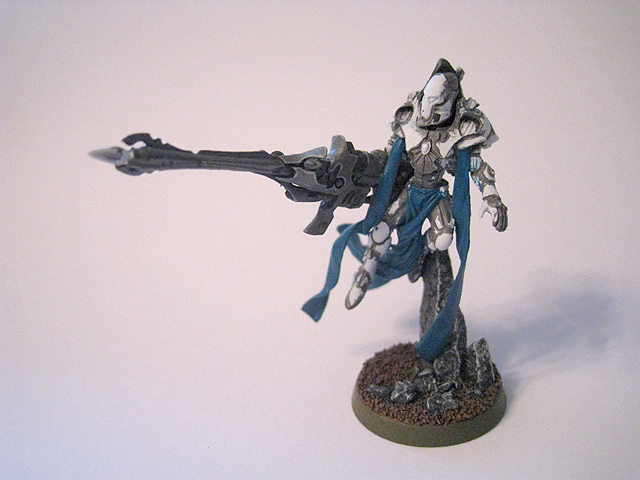 In order to correct this I converted an Exarch using the legs from a normal squad member. 1. 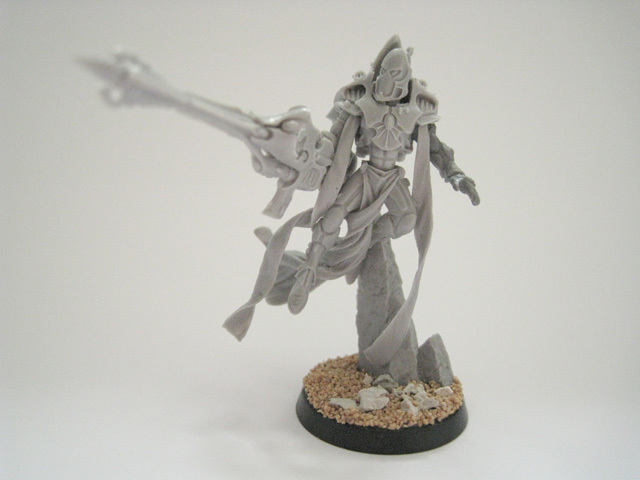 By using the legs from a standard Shadow Spectre miniature, the pose of the Exarch looks a lot more natural. 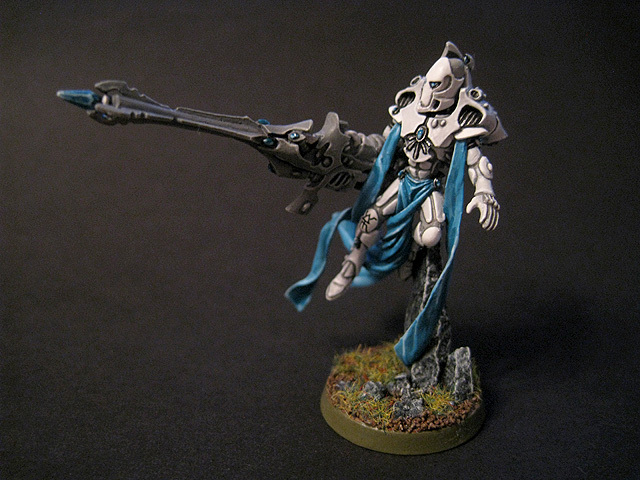 In the rules, the standard weapon fires 1 shot, the Exarch's weapon fires 2 shots and Irllyth's fires 3. This emitter array originally had three parts - the same as on Irillyth's weapon - but I cut it down to just two to show the progression in the weapons' power. 2. 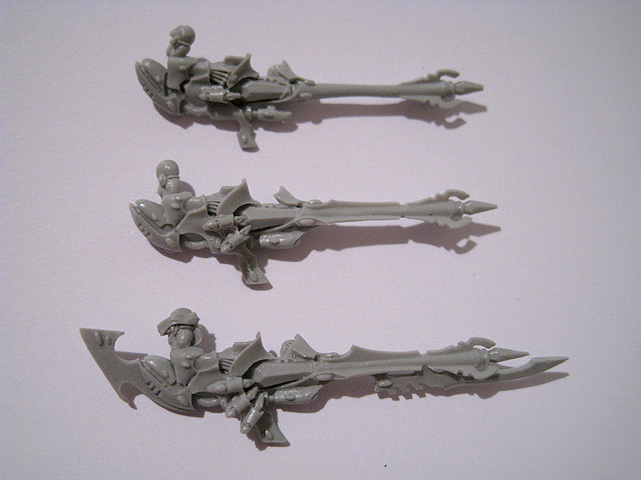 This image shows the three variants of the Shadow Spectre Prism Rifle. 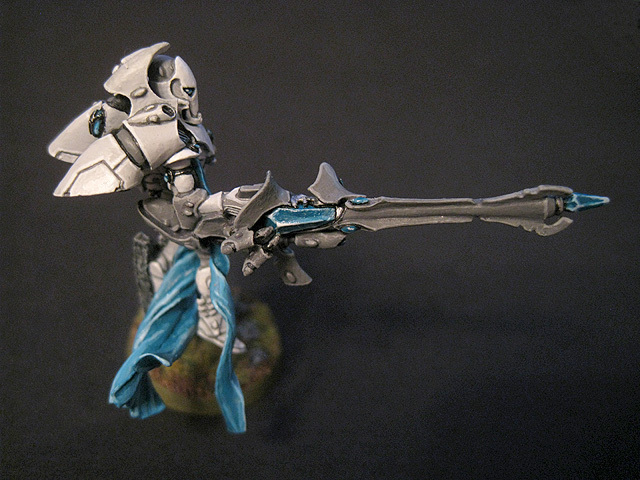 The top weapon is the standard Prism Rifle; the middle is the Prism Blaster used by the Exarchs and the bottom weapon is the unique Spear of Starlight wielded by Irillyth. 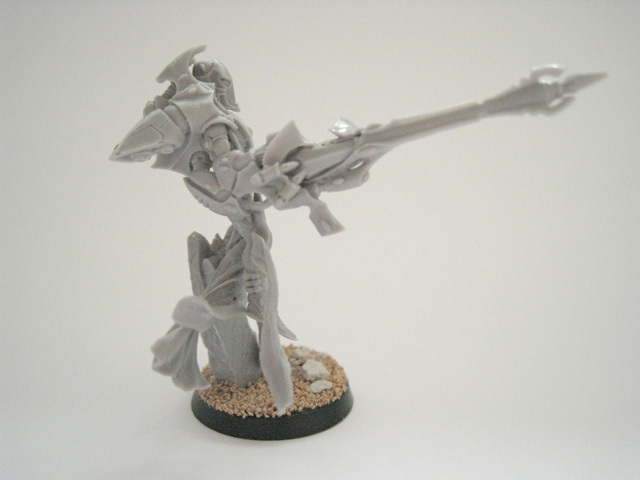 Since the original Exarch arm was used in my Irillyth conversion, I made a replacement from parts from the Dire Avenger kit. 3. 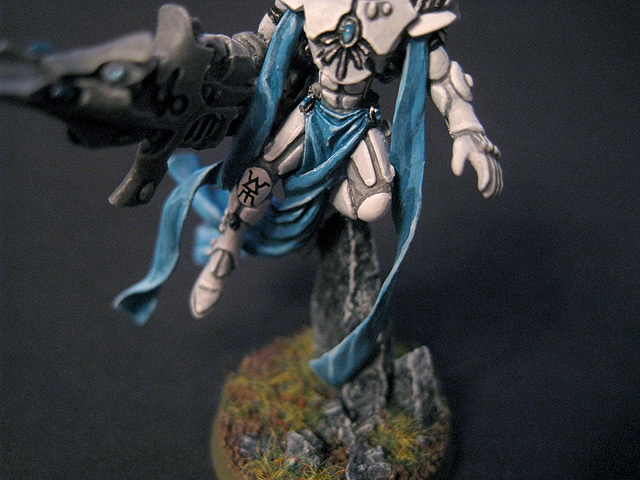 The choice of ribbons helps to further set the Exarch apart from the standard Shadow Spectres; rather than coiling around the arms and flowing behind him, they drop straight down and look more like decorative robes. 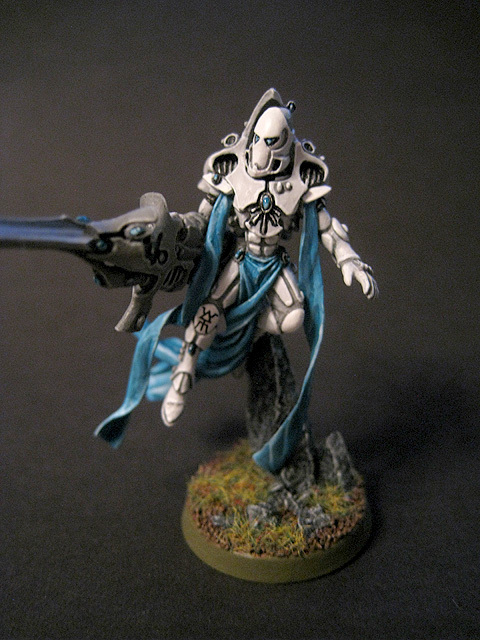 He is also holding his weapon in one hand, unlike the other Spectres. 4. Detail shot of the Prism Blaster. 5. A work-in-progress shot of the painting of the model. 7. 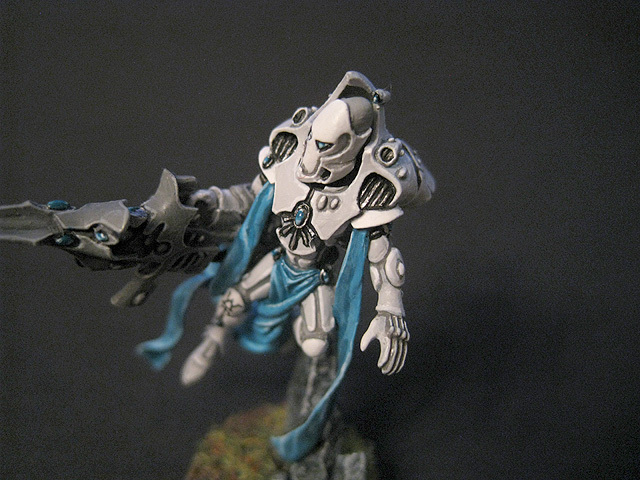 Front view of the painted miniature. 8. Detail shot of the head and torso. 9. Close-up of the legs. A transfer has been applied to the right kneepad, to match the other squad members.